Solitaire Interglobal performed analyses in 2014 that identified over $5.8B in fraud, spanning many industries and organizations. The ability of an organization to build its own procedures and protocols for analyzing fraud is becoming key to profitability and organizational health. Understanding and managing the fraud pattern analysis can be extremely challenging and expensive. 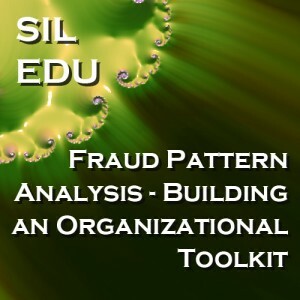 This class covers the areas that have been shown to be critical to effective fraud pattern analysis from the perspective of organizational structure and toolkit inventory in depth. Other subjects that are covered in depth during the class sessions are the various methods for incorporating the fraud analysis into the critical thinking of the organization, the establishment of success metrics and measures, and how to maintain a validation process for the detected patterns. 1 – Discuss the demonstrated patterns of pivotal decision points, scope control, information needs and process isolation for fraud detection. 3 – Discuss the different forms of process and procedure protocols that are being used in the general market, including the advantages and disadvantages of each form. 4 – Discuss and define the normal terms used in fraud detection. 5 – Explore the different metrics and measurements that are useful in monitoring ongoing fraud identification, tracking and followup. 1 – Participant will gain an understanding of the critical functionality and the controls that are needed for fraud pattern analysis. 2 – Participant will have an understanding of flow and dependencies of tasks in fraud analysis. 3 – A successful participant will be able to build a basic organization structure and process flow from the information received during the presentation. 4 – A successful participant will be able to define metrics and measurements for monitoring the fraud pattern analysis on an ongoing basis. Primary audience for this course are professionals who are responsible for reduction of fraud within and organization and those with budget accountability within an organization. Project managers and IT technical team leads will also benefit from successful completion of this course.